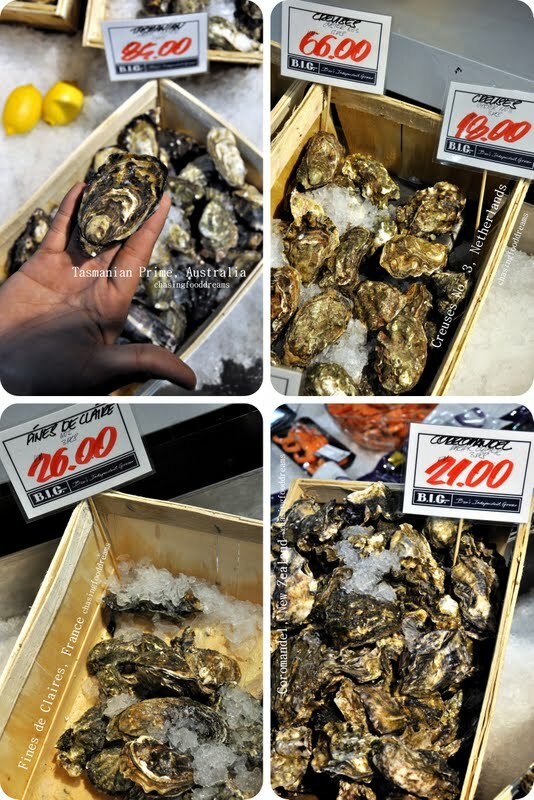 CHASING FOOD DREAMS: SHUCKED, BIG @ Publika: For the Love of Oysters and Seafood! SHUCKED, BIG @ Publika: For the Love of Oysters and Seafood! Barely two days old, I stumbled upon the latest BIG addition in the Ben’s Independent Grocery at Publika. Brought in by BIG group and Southern Rock Seafood, SHUCKED is where you want to be for aphrodisiac oysters and seafood indulgence. It was instant gratification, almost love at first sight, when I saw SHUCKED. Baskets after baskets of precious molluscs lured my lust and I check out the bar quickly amongst the crowd. A good spread of air flown oysters and seafood were beautifully iced at the bar. I just could not resist but to ask for permission to capture the glorious spread thru my lens! Josh Green, Managing Director from Southern Rock Seafood, happened to be present and graciously gave us a brief presentation on SHUCKED. Every seafood and oysters at SHUCKED is air flown in from everywhere around the world. 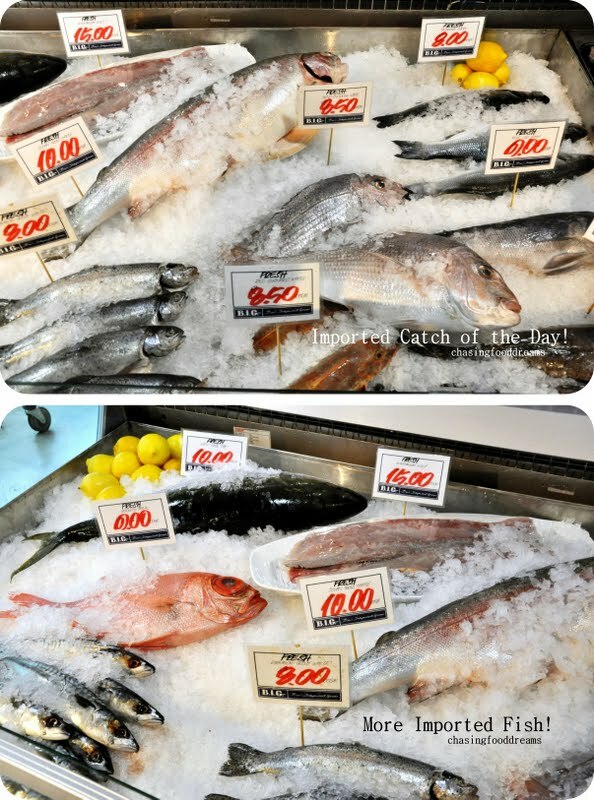 Bringing in the best of seafood and oysters from the prime area and supplying them to the market in Malaysia is certainly not an easy task. We are talking about oysters from New Zealand, Netherlands, France and Australia and seafood from all over as well. For us diners though, savoring them is probably the easiest thing to do! Offering a list of oysters, shellfish, fresh and smoked fish and hot seafood, choices are really interesting from cooked prawns from Netherlands, Langoustine from Scotland, Mussels from South Australia and international fish like Barramundi, Ocean Trout, Wild Snapper, Rainbow Trout, Blue Cod, King Fish and Alfonsino Fish. There is also Smoked Ocean Trout from Australia, Salmon Gravalax and Fresh Herrings from Netherlands. Caving in, we ordered two kinds of oysters for a taste! Even Josh roped in and shucked a few oysters himself! Talk about personalization… we felt honored! The great thing with SHUCKED is that one can order 3 pieces of oyster for tasting or go for the full dozen for full satiation. Our first 3 pieces was Creuses No. 3 from Oosterschelde, Netherlands (RM18 for 3 pieces/RM66 for a dozen) served on ice and lemon. Yes, one can ask for Tabasco but we decided to go pure with a light squeeze of lemon. Briny and salty, this one is said to echo the pure waters of Oosterschelde. It has a clean and almost sharp taste of salt with a soft texture. Our next one was Coromandel from North Island, New Zealand (RM21 for 3pieces/RM75 for a dozen). This one was plumped and creamy at sight compared to our first oysters. A good light creamy pale yellow, the oysters are salty and sweet with a very lovely creamy aftertaste. The texture is soft but slightly more bite than the Creuses No.3. It was certainly pure love at first bite for me! Not into raw oysters... I love or chian (oyster omelette) though...with big fat juicy oysters. Haha, not ngam me, I don't eat raw oyster, any cooked version? Wahhhh...nice bed of fresh raw oysters! same here but like I mentioned, its just so fresh, it didnt need the tabasco sauce... its just so good with lemon already! ah.. jenn, why you eat so much of my kawan?